I love the evening sunlight, so I often hold out until then to take my photos. Sometimes the end of the most beautiful day can become completely overcast, sometimes the overcast day can clear up just in time for a beautiful sunset; it's a gamble I always take, hoping for my lovely golden light. Waiting until the end of the day also affords me the ability to make some edits to my outfit, and I'm a bit embarrassed to say this is the third striped shirt I paired with these shorts before I decided it was the best choice. Love the look and that top is lovely! I hear it's best to take pics later in the evening but I always have so much to do with my little one. I try to get my pics out of the way early so I can run around with her. Love this look and the mixing of patterns! I feel like having time to edit is always a plus (but now I'm curious about how the other tops looked with those awesome shorts....although I seriously love this combo). What a great mix of prints! Love this top and shorts together! Love the shirt. It looks great on you. No shame at all! I definitely give some outfits a few revisions before picking a favorite! This combination is PERFECT! I really like these two together, pretty! A perfect combo. You look great! Loooove the golden light too :) #goldenhour! What a wonderful outfit, I love it! You look so pretty! I do that also, except generally all in the morning before running out to work. No wonder my mornings are so rushed. I really like your pattern mixing! Those colors in those shorts are so pretty! I think most of us do that hun, don't worry. Loving the shorts. I sadly almost never get to take outfit photos in the afternoon, because Ian and I work such different schedules; we're basically tied to Saturday and Sunday morning photo time. (Yes, I could learn to use a tripod but... I just don't see it happening.) The lack of golden light doesn't bother me nearly as much as the inability to make outfit edits. As the day goes on, I often find myself switching things up and finding something that I like better than my original outfit choice. But by then it's too late. And, while naturally I didn't see the other two options, this striped shirt is perfect with those shorts, the colours are impeccable together! That outfit is all that and a bag of chips..lol. I absolutely LOVE it. I have a bunch of striped shirts that I have been dying to try out with some floral bottoms. This inspired me to hurry up and give it a go. LOVE IT!!!! that bag is the cutest! I love the perfect size and the cute little tassel on it! fantastic look! 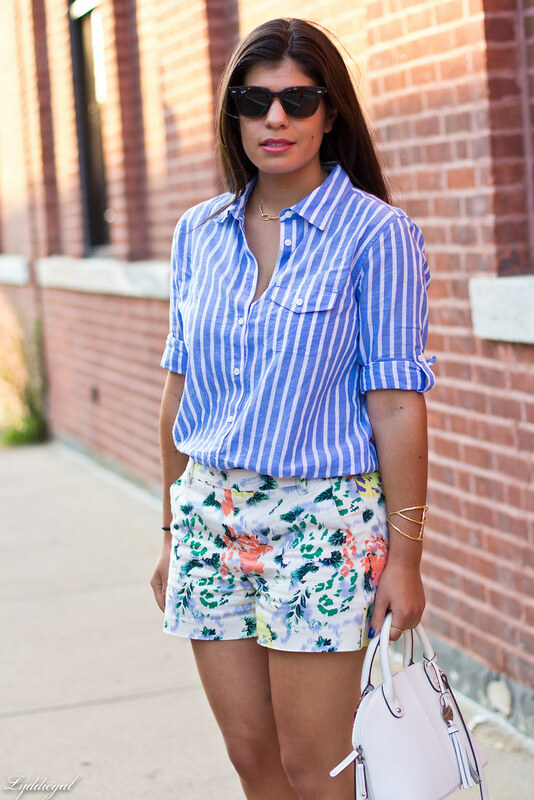 Well, I don't know which other striped shirts you tried before this one, but this blouse looks fantastic with the shorts! I absolutely love how you paired the florals and stripes - you picked perfectly!! And the white accessories are beautiful. This is beyond perfect! The pattern mixing isn't overwhelming...it's right on the money! You have found such a gorgeous pairing. I agree with you about evening light, it can be so great for photos. Sadly, I can't plan any photo shoots since my fiance and I have different working times,so we do it when ever we can and usually if there's no rain it's on Saturday&Sunday. Evening light really is the best! I'm always so sweaty and awful looking by the end of the day, so I'm just super amazed you're still looking prepped and ready to go. Jealous of that. And it's totally okay you tried other shirts on before this one--I'm sure they all looked great, but I love this one! 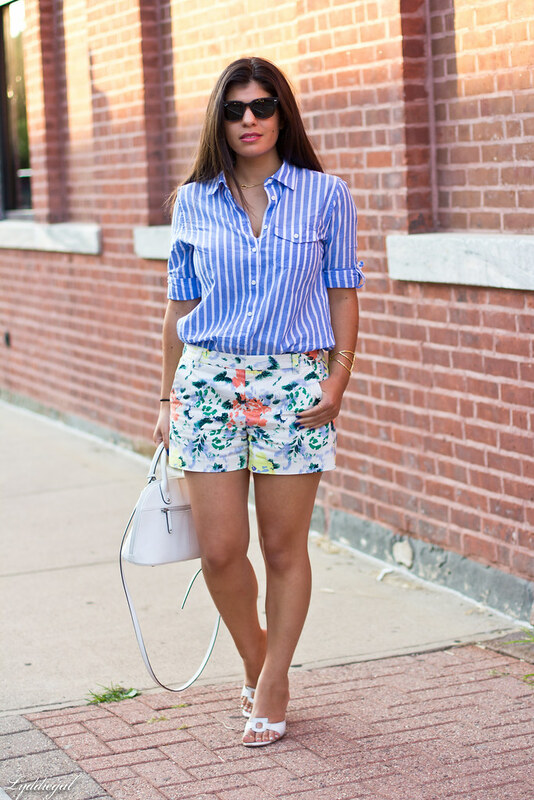 Florals and stripes is one of my favorite combinations. NAILED IT! I don't know what the other tops looked like, but this one really compliments the blue in the shorts! Too cute! 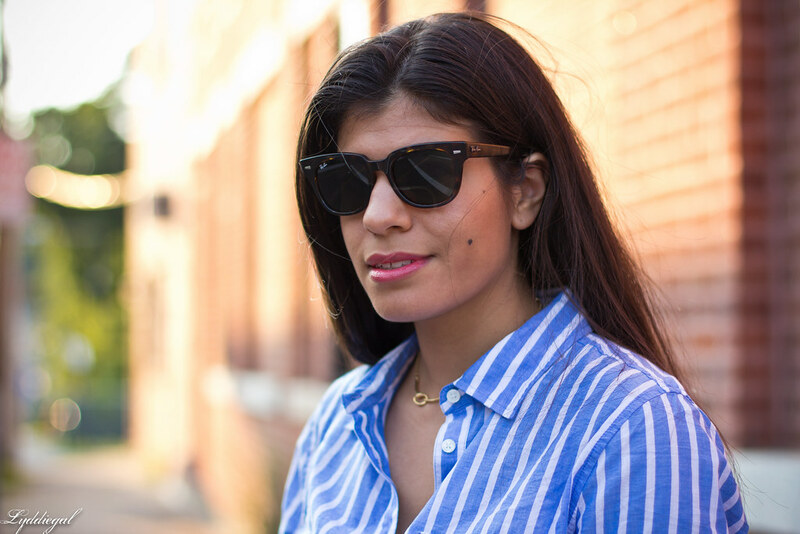 This is a great striped shirt combo for sure! And your photos are always fantastic so the golden light/golden hour thing really is a true winner! Love your outfit third choice was the right choice. Lovely photos! OO I've got these lovely Gap shorts via eBay a year ago (brand new without tags;)only bidder too, best summer buy ever! LOL! It is a great choice though. I love these two together. Gorgeous look dear, love everything. 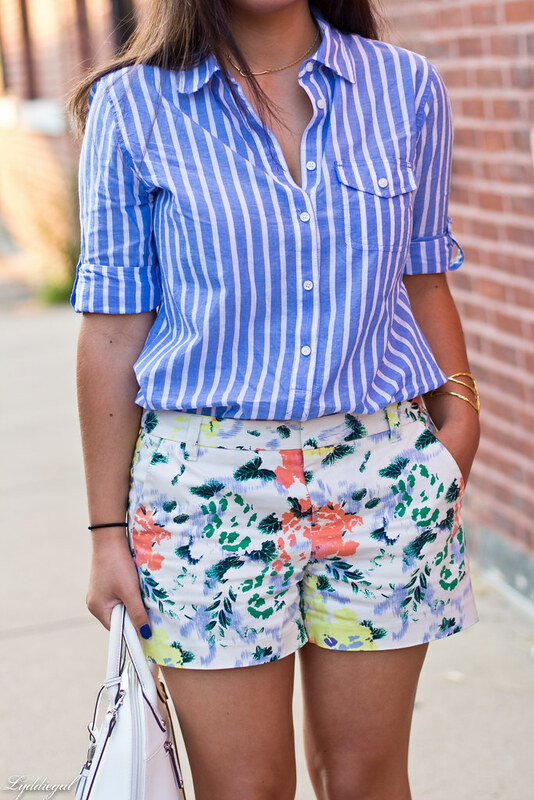 Love the stripes + floral! I'm sad I didn't get those shorts last season - they are so cute! The pattern mix looks great! 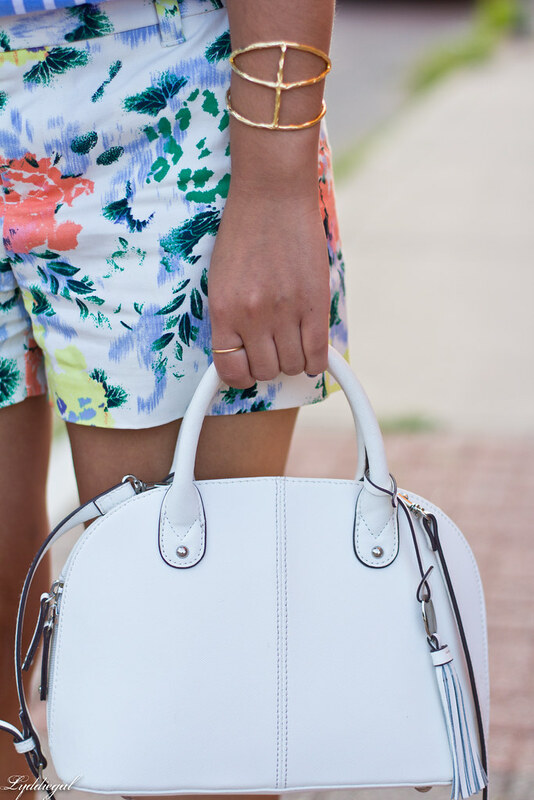 Love that tunic and it pairs perfectly with the floral shorts. So cute! I love your cuff! I do the same thing, in waiting for that patch of sunlight! Here's to hoping that you always find yours! First or last shirt - it's a great pick and it SOOOO works !